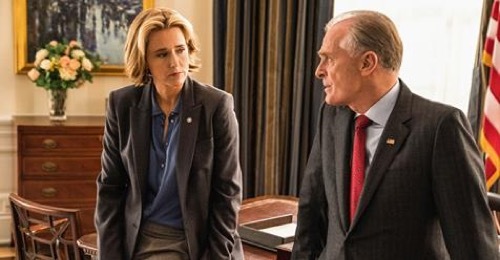 Tonight on CBS Madam Secretary airs with an all-new Sunday, February 17, 2019, season 5 episode 14 called, “Something Better,” and we have your Madam Secretary recap below. On tonight’s Madam Secretary season 5 episode 14, as per the CBS synopsis, “A group of American missionaries become hostages during a violent uprising abroad, and Dalton must confront demons from his past in order to help Elizabeth secure their safe return home. At the presidential residence in Nicaragua, two men sit in a van doing surveillance. They watch and take pictures as several people arrive at the compound. A bomb goes off. They get some photos before taking off. Back at the White House, Liz, Russell and the president talk about the uprising in Nicaragua and the latest incident. They have reached out to the president there but he isn’t engaging. Liz thinks a coalition and a travel ban may help so that they don’t have another Syria issue in their backyard. Stevie is brought into Russel’s office. He is assigning her to his Twitter and Facebook account so he can rehab his image after yelling at the homeless lady. Stevie is surprised and now thrilled about the responsibility of it all. Henry’s brother Shane calls to check on his daughter Sarah who is visiting him and Liz before she is deployed. Her brother hopes her deployment will be postponed. Henry doesn’t think so. Shane wants Henry to do something but he shares he cannot. Shane gets mad. Blake and Matt tease Jay about his plans to meet up with a lady friend. Meanwhile, Liz talks to Chine about Nicaragua. The ambassador doesn’t want to help. She needs them for her coalition. Daisy updates her about US citizens who are there scared and hiding out in a church. Liz heads to the Oval. Gordon doesn’t have good ideas for them other than to send in the SEALS. POTUS doesn’t want that. Liz just wants to get those out of the church alive and negotiate with the president. POTUS gives her the go ahead. Henry arrives home to see Sarah and the kids making dinner. They all get into a heated debate about what is going on in Nicaragua. The talks make Sarah on edge. Liz video chats with the president of Nicaragua. He refers to the kids in the church as terrorists. Liz just wants to get them out. He refuses to be bullied by the US. She just wants to work with him but he hangs up. At home, Liz and Henry talk about Sarah and how she appears shaken up. Liz gets a late night call from China. They are willing to help. Russell calls Stevie in after she tweets about his visits to the zoo to watch the pandas. He looks soft and now he is mad. He tells her to fix it. Henry arranges for Sarah to meet Liz’s brother who has experience in combat zones. Meanwhile, Jay is upset when he sees social media photos of his love interest with another man. Liz talks to POTUS after she learned that he tried to reason with the president of Nicaragua back in the ’80s who was the father of the current president. She tells him he was brave. He tells her they probably wouldn’t be in this situation if things went better back then. Several cancer survivors are at the White House when one young girl spots Russell. She recognizes him as the panda cam lover. He takes a selfie with her. POTUS goes to meet the former president of Nicaragua to talk to him about his son who is leading now. They talk about saving the people of his country if he just reaches out to his estranged son. The next day, the former president comes out against his son and protects those within the church. Later, Liz and the team urge Jay to go meet his girl. Liz takes his daughter for the day. Russell calls Stevie in to thank her for her social media skills which helped get the Children’s health care bill passed. POTUS thanks Liz in the Oval for her work on the Nicaragua situation while Jay’s daughter colors at his desk. Jay meets his girl at the airport. They kiss.